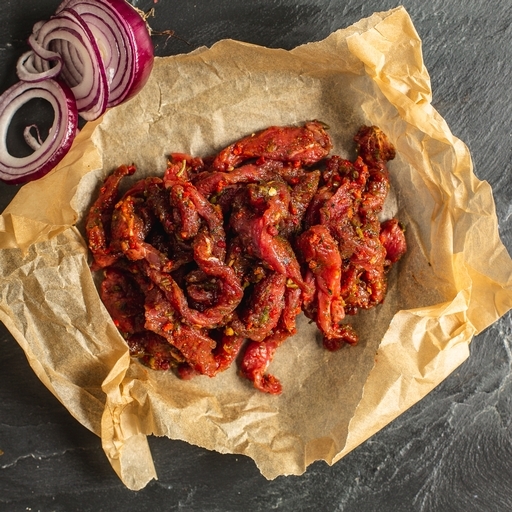 Juicy organic beef fajita strips for making your own Mexican-style wraps. We take steak from grass-fed beef, slice it into strips and toss in fajita seasoning. Just enough of a kick but not too spicy, so the result should be a crowd pleaser. Plus, they’re super-quick to cook. Serves 3-4. Season generously and fry in a very hot frying pan or wok for 2-3 mins until nicely browned. Cut from lean beef, they are fine to cook medium-pink in the middle. They’ll take a little longer to cook if sharing a crowded pan with other ingredients. Ideal served with fried onions, peppers and fresh salad in a Mexican-style wrap.